The mobile future is here now and a network infrastructure that supports mobile initiatives needs to be flexible and scalable, while delivering uncompromised performance and security. 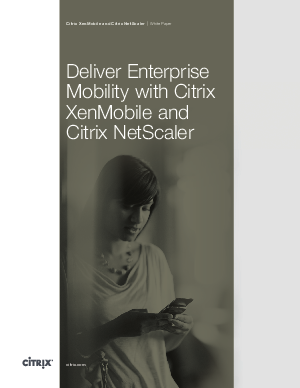 With Citrix XenMobile MDM and Citrix NetScaler, IT can address the full range of enterprise mobility requirements. Here’s a guide to help ensure your enterprise mobile workers are empowered with the full mobility their work requires as well as the ability to use the device of their choice. Take advantage of a complete, robust platform that addresses the full range of mobile business requirements—simply and securely.